Grafton goalie Cadrin Msumba, our reigning Defensive Player of the Year, has again been stellar in net for the Indians. The regular season is almost over, so it's time to start thinking about which guys in Central Mass will make our All-Star team, and win our annual awards. Both the regular season and the postseason will be taken into account in my final All-Star team, so much is still to be determined. But, these are the guys that I'm looking at right now. If you think I've omitted someone, or you would just like to nominate your favorite lax bro, post their film/Hudl page in the comments below, or email them to to me at jparello86@gmail.com. Or, heck, Tweet them to me @HerewegoJoe. Anyways, here are the guys on my watch list by position, they are sorted alphabetically by their school. The bottom also includes my nominees for our end-of-season awards. Obviously, the playoffs will have a dramatic impact on the team and those awards. Oh, and if I have anything wrong (position, name spelling, etc), feel free to correct me in the comments section as well. CMass has tons of talent!!! Love it. No complaining, as we know you can't have, or think of everybody, just throwing a couple out there. -McDonough, soph FO/M, winning about 70% of his draws and adding to the offense. Without him GD is not in as good a place as they are. -Dan Howes, Sr, D has drawn the #1 attack of all the teams since GD began its run. -Mike Tamarro, Jr. A, a bit under the radar but oftn gives the D he draws fits. Here is some others I have noticed for the year. Dixon (I believe, if not, sorry) the FO/M from Wachusett is also a solid consideration. Hands, speed, power! Also, I do not know his name, but saw him yesterday, the LSM from Shrewbury. BIG, strong, good stick, good D with his feet. He may be on here so forgive me if he is. Again, same as above, so forgive me if so, the LSM from Westborough. Solid and all over the field. Lastly, another guy I do not know his name (they don't hand out rosters, or I can't find them), #7, I believe, for Nashoba. Also not sure if he was attack or Middie. He was BIG, strong, great dodged and a cannon for a shot. Curious what and who others may be thinking. Its been a VERY interesting season so far. McDonough not being on here was a flat-out oversight on my part, that kid is one of the best all-around middies I've seen all year, and I've also thrown in Howes after re-watching some of my footage from the G-D Marlboro game. Not sure about the kid from Wachusett, but I've only seen them once this year, and it's been a while, but the kid from Shrewsbury you're thinking of is Chris Campbell, who is on here as an LSM. Not sure who No. 7 from Nashoba is, but I saw that team before they got a bunch of kids back. I'm gonna take a look at Tammoro's film, just because I can't really remember what his game is like, but I'll definitely consider the kid. Thank you Joe for all your efforts. Yes, Campbell. Beast! Great game yesterday and the last time GD matched up with Shrews. Yeah, the Kid from Nash, their offense runs through him. Can pull the trigger! (I think he was #7. I believe the Wach kid was a Mid Wach A All start last year (not sure if it was 2nd team or HM) but he is pretty good. He gave McDonough all he could handle at the X and he is a great athlete otherwise. So many and so little time . Great season for the kids and for yourself! I am sure we/they all thank you. For coach of the year, I know you have him up there already your list. ***I'm not committed to any one school** but you really got to check out Hopedale head coach Eric Moxim. I know usually it goes to the guy who wins the league championship. But you have to recognize what he has done with Hopedale. From probably the smallest town in the Mid Mass league and with the lesser talent then schools like grafton, nipmuc, Worcester and Tantasqua. For a school that has players from 7th grade all the way to 12th grade. With only like 200+ boys in the school system, look what he has done in the past 3 years. From 3 wins his first year to being one win away from taking those kids to the playoffs. That's pretty insane right there. If you gave him the same squads that grafton or Worcester or Tantasqua has you would have the same results those coaches have now. Anyone can win when they have that much talent and players on the field when here is little Hopedale that has 16 varsity players total. Just my opinion. I love the list though. Great job at what you do! #7 Senior Attack for Nashoba is Robert Braceland, who is committed to Plattsburgh. Missed first 3+ weeks of season. Worthy of nomination. Senior pole for St.Johns Kieran Lyons, physical and does all the dirty work. 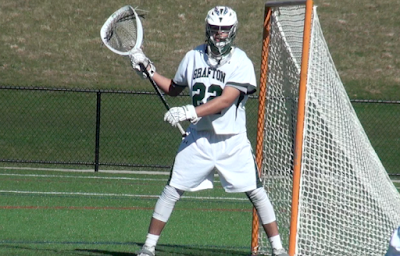 Cj Gallagher for Worcester is the best D pole in CMASS. He's only a junior. Possible an all American this season and if not this season definitely his senior year season. Coach Moxim of Hopedale literally taught my son how to play the game when he decided to switch from baseball to lacrosse. Something he has had to do with many players. He has a wicked sense of humor and cares about the success of his players as individuals and as a team. He is hands down the best coach my son has ever had. He fought hard to bring lacrosse to Hopedale (and has to continuously fight to keep it here). I would love to see him win Coach of the Year!! although Chase K. the grafton attackman is a great player, I think a Cole Fontana exhibits all of the qualities for being offensive player of the year. He shows leader ship, never puts his head down and males a huge impact on the bigger games of the year like his 3 goals against saint johns. Griffin LaPosta is an attackman for Wachusett and in the Player of the Year column you called him Eric.... Great player deserves any award he's in conservation for. Quick hands and great placement. Always been a playmaker. Tantasqua's head coach John Pedace is well deserving of the coach of the year award. He has had several battles with cancer and is fighting another one throughout the season. He helped Tantasqua Lacrosse come together and has only missed a game. shep hill players never get enough recognition .. new to mid wach last year .. improved this year .. some close games with some tough teams. agreed on devin pietz above , also: jake zablocki is a beast at face off x ,, and can score .… tristan pietz draws top d-pole every game and is on pace for 70-80 points this year .. sophomore .. these are breakouts !! I watched Gallagher from Worcester play this week... He truly is one of the best players in cmass. Coach Pedace .. Definately .. Thoughts and prayers for continued recovery . Tristan Pietz should definately be a candidate for breakout player of the year ! I've been to games all over CMass. St. John's #7 Wahlberg has been a huge play maker on both ends of the field although he's not always on the stat sheet. Definately check out his summer highlights. Also definately keep your eye on Mike Fritschy. Although I am a Wachusett alum the kids been killing it this year. Thanks Joe! The fact that you only have 3 Littleton Players on that list means you stopped paying attention joe! You don't have Cameron Shoemaker on that list is a shame! Filthy LSM who plays the game the right way and is a key reason is brother plays so well. You also overlooked Anthony Raussa at Middfield and Chance Rameriez Defense all reasons why the Tigers are 15-2, but perhaps the biggest reason Coach Mike Blanchard! Thanks for giving CMASS lax the attention it deserves. It's continues to grow with newer teams improving every year. We lost our identity a bit with the new state alignment so to some of us who have been a part of the growth, this is exciting. Breakout player of the year: Dan Turgeon. Leading scorer in Mid-Wach A. Scores, assists, & plays tough-smart "D". Old school all-round lacrosse player. Also, check out F/O for AMSA, heading to Air-Force Academy, smart & quick. Montgomery has to be a front runner for coach of the year. He brought a team together in his first season that everyone thought was going to be washed up after losing the amount of seniors they did. Westborough picked up their first win over SJ in 8 years and took the life out of Grafton. Shout out to Mike Kelly of St. Bernards for coach of the year. Only 80 boys in the entire school! If Phil Jackson doesn't win Coach of the Year, I'll be shell shocked. Great man. Tom Muir is more than deserving for breakout player of the year. As a sophmore he has taken over the Warriors offense from Andrew Tichey. He dominates the face off X, plays lock down D, as well as runs their offense. One of the toughest kids to match up on in cmass because when you think you stopped him, he turns into a feeder and gets the ball to the trio of attack for a goal. Also has a great club program and is an extremely coachable kid who plays the game old fashion and right. Hey Joe – as always some really good stuff. Spread out nicely between Leagues and divisions. a. Not so much the school size, or available talent pool, but the actual successes in the past 3 years and being on the brink of making the playoffs. Pretty good stuff. 2. Defense – adding Kieran Lyons makes sense. 3. LSM – Nick Hart Grafton – has been unbelievable on defense, ground balls, and generally unnoticed game changing moments. Personally I think he and Jimmy Donadio were the difference makers in the Grafton vs. Cohasset game [and we know how good Cohasset is after defeating Medfield] as as well as all the big Grafton games like the decisive win over D1 Franklin – currently ranked 17 in the ESPN MIAA Poll. -Not just another SAT word for all those juniors out there. Gotta love how you get around to so many games and hold the smaller D3 schools and less competitive leagues [for now – it always seemed to be rotating] to the same measuring stick and use the same qualitative adjectives to describe play. All one has to do is read some of the EMASS [Eastern Mass] Top 25 lists and Player lists and in-depth articles and they are always about the same schools, leagues, and coaches. -Central Mass is cool in that so many of the kids actually know each other from other sports or towns or even have families that go back a long way. -Just yesterday I was at the Worcester/Grafton game at Foley and ran into a very close friend of my wife's whose son plays for Worcester. We got a coffee then came back to game during third quarter. Then we caught up at end of game too - funny but I didn't recall until later that she held our first baby shower for Cadrin over 18 yrs ago! -I'm sure there are many stories like that across our central mass teams. Lacrosse is much more than just a game with wins, losses, awards and potential college bids. For us it brings old friends back in touch and introduces us to new friends. And for that reason and in this season; we can be truly happy for our all of our son's successes and the defining experiences that this very old sport has taught all of us. All your offensive players of the year are attack.. Except laforge from tynsgsboro .. Check the miaa central mass leading scorers sheet . Pietz from shep hill is the only other midfielder in top 10 ..
And, while this is a "potential" player list, the lines have to be drawn somewhere. Can't imagine when Joe actually makes his picks!! Haha, so many comments to respond to, I don't know where to begin. First of all, thanks to everyone here, and everyone who emailed/Tweeted me for the feedback. This is our one big "interactive" post every year, and kids I either haven't seen, or have overlooked simply because there are SO many players, are always brought to my attention. On that same note, if I left your favorite lax bro out, understand that sometimes I just flat-out forget kids I meant to put in (Liam McDonough from G-D and Cam Shoemaker from Littleton), and other times I have rosters that doesn't have positions, or classes, etc, so I wait for readers to help fill in the gaps. Every year we joke that I'm basically printing every CMass roster here, but this actually really does help me narrow things down, especially for D-Poles and LSMs. I've said it before and I'll say it again: I'm no lacrosse expert, just a guy that watches a lot of games and talks to a lot of people. So, if I only see a team once a year, it's hard to tell who their impactful non-offensive guys are. That's where all of you and the coaches come in. I'll be making some tweaks to my Award Winner Watch Lists in the coming days, and I have to say this year is the most wide-open in every category since I began covering CMass Lax. I really don't have a favorite for any award yet this year, and I don't know what I'm going to do with Coach of the Year. The fact that guys like Harry Jones from Worcester and Nate Skermont from Shrewsbury, two great guys and coaches, aren't even on the list should tell you how many amazing candidates there are this year. In conclusion, thanks for the help, and know that I'm reading all the comments, emails, Tweets, etc. Lots of great ideas in there, including Aleke's "Unsung Hero" award, and several email suggestions that I do different superlatives like "fastest shot," "quickest hands," etc. Those may be tough to figure out, but I like the way you guys are thinking. This is supposed to be fun, after all. Good luck to everybody the rest of the way, and thanks for checking out the site! Hey joe, what's your thoughts on CMASS All-Americans this year. You need to take in consideration the difference in competition for each League/Divison. Mid Wach A is big difference than Mid Wach B. And as well strength of schedule. Agree with prior post that consideration needs to be taken into account of strength of schedule and Mid Wach A vs Mid Wach B. Also, leaderboard for CMASS doesn't have all schools represented as for some reason not all coaches post stats weekly, which is disappointing. Joe, do you have a All American Watch list? Saint John's LSMs Andrew Estella and Joe Fitzpatrick have been consistently going against some of the best midfielders in the state and have been stellar lately. Just worthy of a consideration. Just looked on laxpower. Hopedale has quite possibly the weakest non-league schedule I have ever seen. They have not beat one team with a winning record The combined record of teams they have beat this year is 27-97. Something to think about. Possible All American candidates? : Cadrin Msumba(Grafton), Curtiss vachon(st. Bernards), C.J. Gallagher(Doherty), Cole Fontana(Grafton). agreed with post about strength of schedule … take a look lax power … scroll all the way to the bottom and you will find hopedale, st berns, marlboro, bromfield and pretty much all the techs .. go higher upper middle , you see leominster , shep hill , littelton .tyngs. ( all mid wach B by the way and who also play mid wach A teams … you also see grafton ( who arguably plays the toughest sched in central mass .. also worcester. sorry to be brutally honest .. but some of these teams just flat out play at a different level of lacrosse, yes ,, there are some good players , and you still need to put the ball in the net .. but you will never get a true honest "first team" "second team" etc. But central mass lacrosse continues to improve and get noticed and joe is a huge part of helping with this !! great job and thank you ! Joe P. is not picking "best team". He is picking the best players in their respective positions. So no need at all to call out any teams for their "weak schedules". Who would you have on All-American watch list? I also believe strength of schedule comes into place for this, also with the all-star awards. Weak scheds produce players with big numbers that, surely talented, would not necessarily look as great if they faced the best teams in the area in 10 out of their 16, 18 or 20 games. Trying not to take anything away from a kid having success where he is but a 25 goal season in one league, with strong out of conference (ooc) or out of league (ool) match ups, may be a lot more impressive than 45 in another league that may not be at a high a level and the ooc and ool schedule is full of below .500 programs. It's a part of the game all honest observers recognize. Reference the college game. A 25 goal scorer in the ACC or Ivy League would get s lot more attention than a 25 goal scorer in America East. Again, probably both fine players but you'd have to take into account the opponents to judge which is a better player. Pedace from Tantasqua has to be the COY if you understand the story behind this season for him. I see peoples points about strength of schedule. But the other side is that on teams without the depth of others there is a lot more attention payed to the top scorers. How many kids are seeing a box and one type defense on the balanced teams. What about the fact a player can throw passes to multiple kids that can make a tough catch and then score. Instead of missing the ball and having a turn over. I'm sure there is no way to quantify how different players would do if they switched teams. I have only seen teams my sons team plays against. I certainly can't have a fair view of players I have never seen play in person. To automatically dismiss all players that don't play in a certain league is harsh. I always think of the goalies. The ones on weaker teams get shelled every game with no hope of having good numbers. The ones with the better reputations tend to come from teams that are either very offensive minded or play against a lot of teams that play a controlled style. Not entirely fair but no real way to see it from afar. Thanks to Joe the kids have all this exposure so we can move the mouse and read about all the great players we don't get a chance to see in person. Great job Joe and good luck to all the players in the playoffs and to the seniors good luck in your future endeavors. If SJ 's 16 that don't play were a team on their own they would make playoffs if they played a CMASS schedule. If these 16 played on their home team half of them would be on this list. Dads, let's stick to what Joe asked for - nominations of your favorite lax players. he didn't ask for iopinions as to why kids shouldnt be on the list. Goes against the spirit of what he is trying to do, which is to recognize the hard work and talent of all the nominated players. If only there was a CMass lacrosse discussion page for all this banter. The Laxpower forum is mainly EMass (I try to inject CMass stuff there when I can but it usually dies a lonely death....maybe the people here should join up and join in. Eh?). The MassLive forum is WMass. So, thanks to Joe P there is a discussion here. Whether it is the right or wrong place for some of it is individual preference but at least there is banter. Thank you Joe! guess what people !! joe doesn't pick all americans and all stars …. the coaches of each league do … so lighten up and let joe do his thing. joe . i wouldn't even put your thoughts down for all americans . its a very cloudy subject and quite frankly, very political .. I wouldn't do it if i were you ..
Never to early for All-American thoughts. But, Cole Fontana from Grafton is an unlikely candidate since he is a bottom feeder. Msumba is a serviceable goalie, except the kids from Saint Johns, Algonquin, Westboro, and Nashoba are simply better. Look no further: what coach in the running for Coach of the Year built a lax program from scratch? STARTED a high school program with kids--most of whom had never picked up a stick? Coach Eric Moxim is changing lives in Hopedale. There is no coach more passionate about the sport of lacrosse and no coach more dedicated to the survival of the game. His passion motivates both the girls and the boys and keeps them going without any feeder program of any kind. His vibrant personality attracted kids dedicated to other sports and recruited them to take the chance on a new sport. Now his team has gone from barely winning a game to being on the cusp of qualifying for tournament. Absolutely in it for he love of the game! We cannot think of a soul more deserving--just wish he could coach boys and girls! Jared Collari (Littleton) Mr.Playmaker Check his assists. Joe, thanks for your article. To the person who called me a "serviceable goalie". Here are some stats to prove to you that I am not only as good as the "simply better" MidWach goalies, but that I am one of the top goalies in Central Mass leading one of the top defenses in Central Massachusetts if not the Commonwealth of Massachusetts. To close... How many of those goalies have won a District Title in their respective Division? And how many of those goalies then won the State Semi to qualify for the State Title? The answer is none. Do not refer to me as a "serviceable goalie" as I have worked my tail off to be considered with the class of great goalies such as Giles Ober, Chris Gorman, and Steve Kerr, and my predecessor Eric Thompson. Cole is really good, not a bottom feeder. Nashoba??...Joke! They have 2 players that are all-stars, tops! Coach Tim Montgomery from Westborough has to be at the top for Coach of the year picks. He has taken a team that wasn't even on the radar to be a contender this year to become one of the top teams in Central Mass, which is filled with some talented teams. He motivates his players to play at the best of their potential and has created a team with the best camraderie I have seen in Westborough in the past 6 years. There are not many stars on this team (with exception of Trevor Mcnamara) just a bunch of guys playing their hearts out for the coach and teammates. To the people chirping Grafton for being "over rated" and having to easy of a schedule... have you seen the teams Grafton plays outside of their division? Franklin, Cohasset, Westoboro, Algonquin, etc. if those aren't good teams then I don't know what is. Who are you to say Msumba shouldn't be reading this? Excellent player and is always thinking about his team and the games he has ahead. Don't label him and he won't have to respond. Mike Najemy from Grafton is a great shot blocker and an average defensive midfielder.